- BULGARIE – Plodiv - Plovdiv's Roman Stadium is due to undergo an overhaul worth some 700 000 leva, with restoration works due to be completed by December 15 2011. The facility is among the largest Roman structures in the Balkans. The massive edifice is 180m long and had a capacity of over 30 000 spectators. It is believed that it was built during the reign of Septimus Severus (193-211). The reconstruction process will be carried out by a consortium selected in open competition staged in March this year. The site is to be renovated, while concrete blocks and other modern construction will be removed so that the archaeological area can be revealed, the report said. The Roman stadium is located in the Plovdiv city centre, but only part of the edifice can be observed from the Djoumayata Square, as most of it is still underground. Further excavation of the site is perceived to be difficult and costly. The stadium is one of the many Roman remains in the city, which include a very well preserved amphitheatre in addition to the ruins of the Agora and a second theatre. There are also the remains of an aqueduct, temples and villas. - ROYAUME-UNI – Glastonbury Abbey - Pottery fragments from an excavation archive of Glastonbury Abbey have shown the site dates back to the Dark Ages, which is later than previously thought. The research project into the 1951-1964 excavation archive have shown humans occupied the site in the late 4th or 5th centuries. Archaeologist John Allan said: "We hadn't realised these periods were represented in the excavated pottery." Other finds include "exotic" pottery from Italy, Spain, Portugal and France. "A scatter of exotic Saxon, Norman, medieval and later ceramics attests the great wealth of the abbey. "Scientific analysis has now established the precise origins of some of these finds; the most distant come from Italy, Spain, Portugal and France," said Mr Allan. 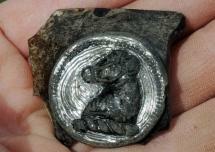 Despite the find, there is no evidence to show whether the site was being used at the time for religious or secular activities. 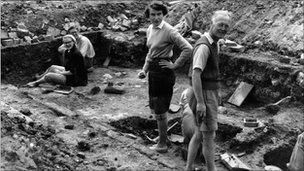 The archaeological dig was carried out during the 50s and 60s by Ralegh Radford and the new research into his finds has been carried out by the archaeology department at Reading University. Glastonbury Abbey was regarded as an important place of pilgrimage for Christians built up around the legend of Joseph of Arimathea, Jesus' uncle who is said to have visited Glastonbury to spread the word of Christianity. Apart from discovering the early history of the abbey, archaeologists have also revealed more about the medieval history of the Benedictine abbey and the precise origins of these finds. The curator at Glastonbury Abbey, Janet Bell, said: "The abbey was using high quality tableware such as the Saintonge polychrome jug from western France. "This probably came to the abbey through the Bordeaux wine trade in the 1300s and would have probably been used to serve wine at the monk's table. "Other exotic finds include a tin glazed tile from Seville, which probably decorated the abbots lodging around the time of Henry VIII's reign." The abbey was destroyed and pillaged during Henry VIII's dissolution of the monasteries in the 16th Century. - USA –Pleasant Valley Road - Details emerge after ages-old human remains were found at an ochard on Pleasant Valley Road in Vernon. Archaeologists are poring over a total 4 of sets of remains. The first was found early in April, the other 3 were located nearby shortly after. They were in the fetal position, keeping with First Nations burial traditions. "The teeth were quite worn, so that's very diagnostic of ancient First Nations," says Eric Forgeng, an archaeologist with the BC Archaeology Branch, "the pictures I've seen would suggest the remains are in a pretty good state of preservation," he says. - ROYAUME-UNI – Harewood – So much of what is known about Harewood’s history focuses on the stately home and the comings and goings of its inhabitants over the years. But a team of archaeologists from York University is looking back at the history of Harewood’s original manor house, built long before the current home was created, and they have made some intriguing discoveries. 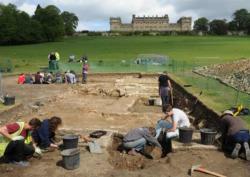 In the shadow of Harewood House, near Leeds, undergraduate students from the university are carrying out the painstaking task of unearthing the remnants of Harewood’s predecessor, Gawthorpe Hall, a medieval manor house that was demolished in 1773. The excavation is providing important new insights into the rise of the Lascelles family which still live at Harewood to this day. They have already discovered artefacts including a coin dating from the early 15th century, an 18th century chamber pot, decorative glassware and wine bottle fragments, decorative pins and a thimble as well as ceramics from the medieval period up to the 18th century, helping to tell the story of how the family lived, how the hall was decorated and more besides. The excavation, is being led by Dr Jonathan Finch, of the university’s department of archaeology in partnership with York Archaeological Trust. Dr Finch said: “As well as providing a much longer history of Harewood that stretches thousands of years back into prehistory, the archaeology will give us a unique insight into the impact the Caribbean sugar industry and slavery had, not just on the fortunes of the Lascelles family, but on English landscape and society as a whole over 200 years ago.” Gawthorpe Hall was built by the Gascoigne family in the 13th century. It was acquired by the 1st Earl of Strafford, Thomas Wentworth, in 1614, and several modifications and additions were made before its sale to Sir John Cutler in 1656. The medieval manor house again changed hands in 1738 to Henry Lascelles, a wealthy trader with business interests in the West Indies, and was inherited in 1753 by its final owner, Edwin Lascelles. Edwin commissioned architect John Carr and work on Harewood House began in 1759. For 12 years, the Lascelles family continued to live in Gawthorpe Hall while their new home took shape on the rising ground above them. In 1771, they left the hall to move to Harewood House with its brand new Robert Adam interiors and Thomas Chippendale furniture.